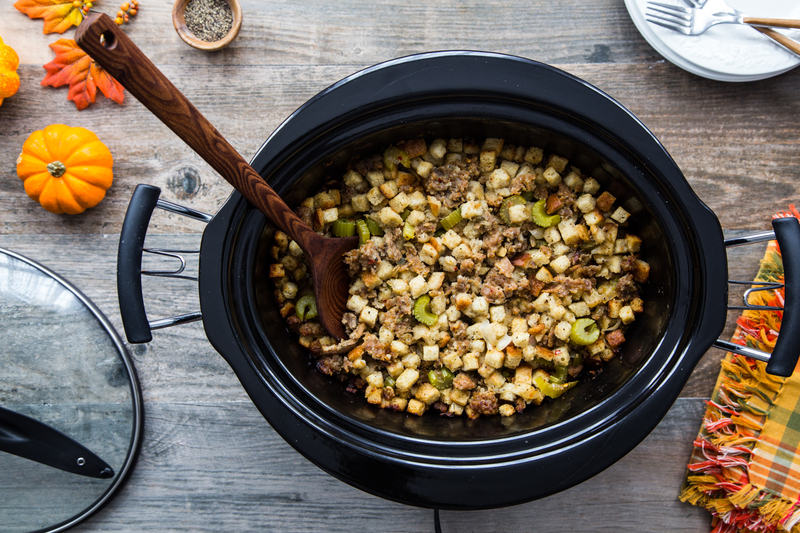 This post, Slow Cooker Italian Sausage Filling, is sponsored on behalf of McCormick. All opinions are, as always, my own. Thank you for supporting the brands that I love and that help make Jelly Toast possible. Thanksgiving is one of the few times during the year when my menu rarely deviates from our family’s favorites. Our turkey varies ever-so-slightly but typically involves a bacon herb rub like my bacon herb oven roasted turkey. Cranberry relish is a staple with an occasional shift like this year’s cranberry marshmallow relish. Basic recipes that remain pretty much unchanged but that occasionally get a subtle tweak. The recipe that I have been adamant will never change in our house is my mother-in-law’s sausage filling recipe. This is hands down my very favorite stuffing recipe ever, and one that I will stick with for years to come. This year, however, I am trying something slightly new with my recipe. I’m making it in the slow cooker! Same recipe, different cooking method. I am resistant to change with many things about my Thanksgiving menu, but when an idea comes along that just makes logical sense, I have to at least give it a try. And cooking stuffing in a slow cooker just made too much sense to me to ignore. 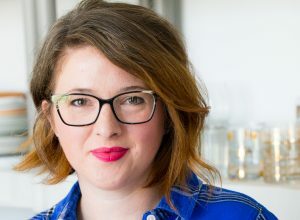 I have never been a fan of stuffing cooked in the bird, it tends to be mushy and often requires the bird to be overcooked in order to cook the stuffing all the way through. Because of this, my stuffing is always in a separate casserole dish taking up precious oven space. In our old home, we had a double range oven that allowed me to cook different dishes at different temperatures. In our new home however, we have a standard range that makes it a little trickier to cook a variety of dishes for a big gathering. This year, I have adapted my very same Italian sausage filling recipe to be cooked in the slow cooker. Same flavors, same ingredients, but instead of the oven, the stuffing can cook away on the counter top freeing up precious oven space for the turkey and sweet potato casserole. I was nervous that the Slow Cooker Italian Sausage Filling would be too moist for my liking, but with a conservative hand when adding the stock as well as cooking the stuffing uncovered for a time to allow it to ‘dry out’ a bit at the end, the end result was quite lovely. The slow cooker stuffing is a bit more moist than my oven version, but not too moist. Even my husband was impressed and he is even more stubborn in his love of our sausage filling than I am. There were still delectably crunchy bits at the edge and moist, but not mushy stuffing in the center. 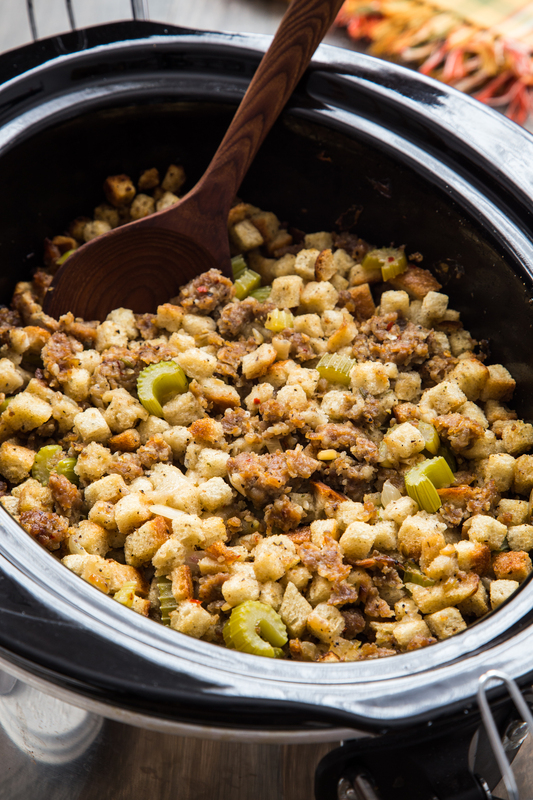 Have you tried stuffing in the slow cooker? I would love to hear about your Thanksgiving cooking traditions! Brown sausage in a large skillet over medium heat, breaking up with a wooden spoon, until cooked through. Remove sausage from pan. Leave about 1 Tablespoon of fat in skillet and remove excess fat. Add olive oil and butter to pan and set back over medium heat. Sauté onion, celery, and garlic for about 5 minutes or until vegetables begin to soften and garlic is fragrant. Add walnuts (if using) and cook an additional 30-60 seconds. Season vegetable mixture with salt and pepper. Remove from heat. 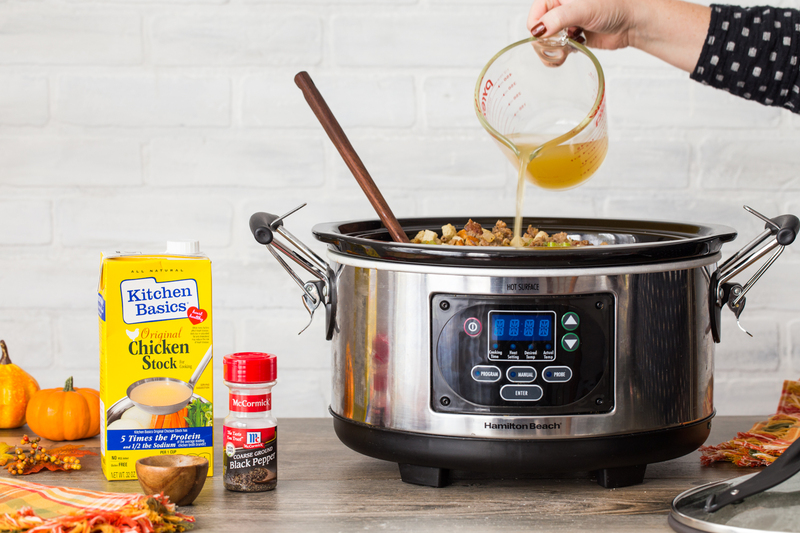 Spray the inside of a 6 quart slow cooker with non-stick spray. Add bread cubes, sausage, and vegetable mixture and stir to combine. Add broth in small amounts, stirring to determine consistency. 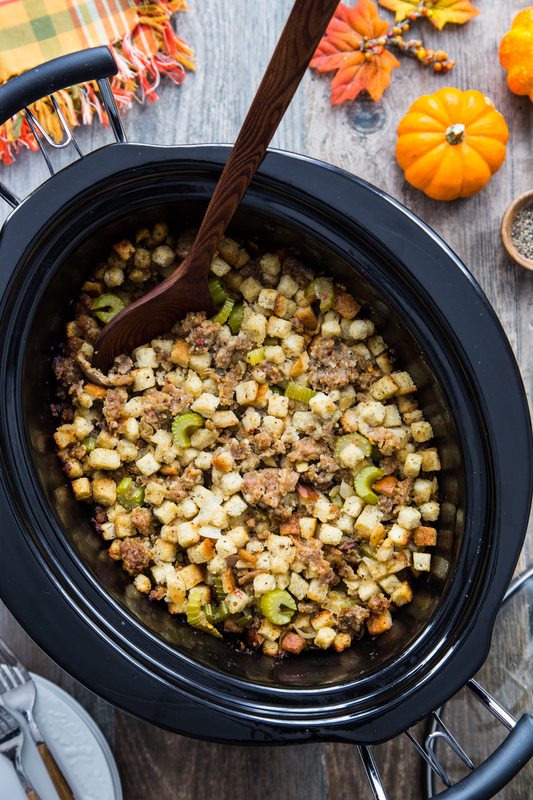 Add up to 2 cups to achieve desired stuffing consistency. Cook covered on low for 3 hours. Remove lid and continue cooking for an additional 30 minutes.